Specify they seek to conduct a Non Recertification Proficiency Exercise. Applications will be reviewed monthly. CFCE certificants are required to take a proficiency exercise in order to satisfy CFCE recertification requirements in the third year from initial certification or last recertification. Certificants may take a proficiency exercise to satisfy accreditation, professional certification, or organizational requirements required by their employer or laboratory. Many laboratories and organizations require their personnel to demonstrate proficiency on a regular basis. Although this is a free service offered to IACIS members, non-members that wish to participate will be assessed a fee in accordance with the established fee schedule. Proficiency tests are based on a set of approved CFCE core competencies​. The proficiency examinations are comprised of practical skills and demonstrated knowledge points. 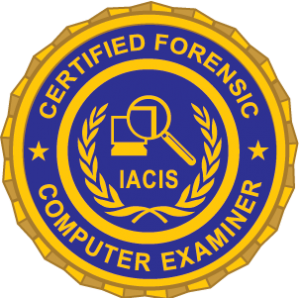 Therefore, certificants may be required to perform an actual forensic examination on a forensic image file and answer questions regarding their examination findings. Proficiency exercises are only available to current CFCE certificants. Certificants are allowed 90 days to complete the exercise and must attain a minimum score of 80% to pass. Certificants wishing to take the proficiency exercise as part of their recertification may only do so within their third year of certification. For example, if you received your original CFCE in 2012 or last recertified in 2012 then you must take a recertification proficiency exercise in 2015. The proficiency exercise period is open February 1st through October 31st of each year. The Proficiency Exercise must be completed prior to 2555 GMT October 31st.